One person’s outrage is another person’s rapture. Photo credit: DonkeyHotey / WhoWhatWhy (CC BY-SA 2.0) See complete attribution below. On issue after issue, Americans reject the policies of President Donald Trump and his GOP cohorts in Congress. However, thanks to the Electoral College, shrewdly gerrymandered congressional districts, a distribution of Senate seats that favors small states that often elect Republicans, and deep-pocketed conservatives, the US has become a country in which what the majority wants has become irrelevant. As a result, those opposing Trump see themselves confronted with an avalanche of legislation, nominees, regulations, executive orders and policies that they believe will do lasting harm to their country. And while Trump promised his supporters that they would get “tired of winning,” as the president’s first year in office nears its end, his opponents are just tired. The past week is a perfect illustration of what they are up against. On Tuesday, Alabamians narrowly rejected the Senate bid of a man whose views have not been considered mainstream since the 1850s. On Thursday, the Federal Communications Commission (FCC) handed cable providers the keys to the internet by rolling back so-called net neutrality rules. 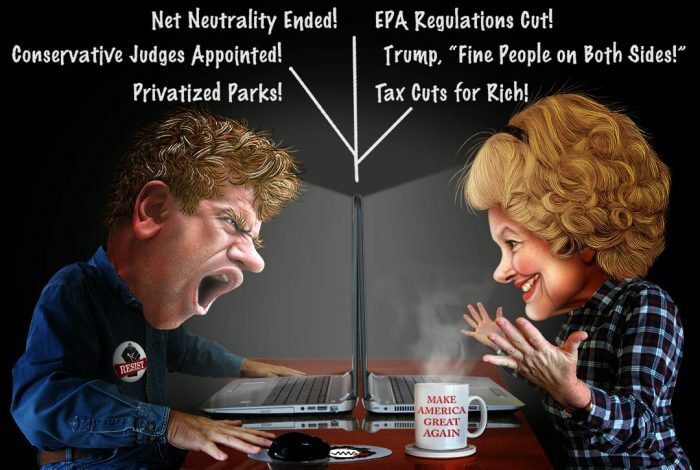 A recent poll showed that 83% of Americans oppose this plan, which is spearheaded by Ajit Pai — a former Verizon lawyer originally appointed by President Barack Obama and elevated to the FCC chairmanship by Trump in January. Next week, Congress is slated to vote on — and approve — an unpopular tax cut that will primarily benefit large businesses and the wealthiest Americans while also putting in place a slew of other GOP goodies. And this is just a 10-day stretch in the age of Trump. His opponents call themselves “the resistance” but what they really need is persistence in the face of a tsunami of policies that aim to undo whatever gains have been made over the past decades to protect families, kids, workers, consumers and the environment. Though they may not specifically support what Trump is doing, the president’s backers often seem to be satisfied that he leaves Democrats angry and frustrated. Anti-Trump forces did book a win earlier this year when their phone calls and emails played a big role in preventing the rollback of the Affordable Care Act, which is also experiencing renewed popularity. But there are only so many times the troops can be mobilized before experiencing a type of “outrage fatigue,” especially if they get sidetracked by Trump’s tweets or meaningless sideshows. And, of course, for the most part the Republican congressional majority, when it can put aside its own differences, seems to not care what voters think. In the past, those opposing the GOP’s agenda might have hoped that the courts would provide some sort of judicial safety net. However, one area in which Trump has been effective is stacking the courts with ideologues. That in itself is a source of great frustration to the opposition because all but the most incompetent Trump nominees get a pass from the Senate and will sit on federal benches for years to come. So where does that leave those experiencing outrage fatigue? There is too much going on to fight on all fronts, especially because some of these battles cannot be won. That does not mean anti-Trump activists should stop calling Congress, comment on rulemakings, write letters to the editor, etc. But it does mean that their actions should be focused where they will do the most good. The Alabama Senate race has shown that the only way to truly prevent Trump from pushing through his agenda is at the ballot box. Legislatively, everything will be more difficult for the GOP in 2018 because Roy Moore lost that race. In the midterm election, the so-called resistance has to focus on putting up candidates who can win across the country — in national, state and local races — and providing them with the support that allows them to do so. At the same time, opponents must mount a vigorous fight against further GOP efforts to suppress the vote. To win in 2018 and beyond, Democrats will have to overcome gerrymandered districts and attempts to keep core Democratic constituencies, such as minorities and young people, from casting their votes. In effect, they have to win big to win at all. This, too, is illustrated by the Alabama special election. Doug Jones won the overall vote but only one of the state’s seven congressional districts. The reason is that these districts are drawn in a way that allows Democrats to win a tiny minority of them by a huge margin while Republicans win the rest by narrower but still comfortable margins and thus ensure that they have more representatives in Congress even if Democrats get more votes statewide. That is precisely what Democrats are up against across the country and it is an obstacle that can only be overcome by turning out in massive numbers when it matters. And that’s why Democrats can’t allow frustration about what is happening in Washington to sap the energy of the resistance. They have to keep their eye on the prize — which is to begin to change the power structure across the country on November 6, 2018. The cartoon above was created by DonkeyHotey for WhoWhatWhy from these images: women’s hair (Deborah Austin / Flickr – CC BY 2.0), woman’s face (Pete / Flickr (CC BY-SA 2.0), man’s face (Paul Cross / Flickr – CC BY 2.0), table (Mike Burns / Flickr (CC BY-SA 2.0), fist (KeithTyler / Wikimedia) and Resist art (resistsymbol.com).